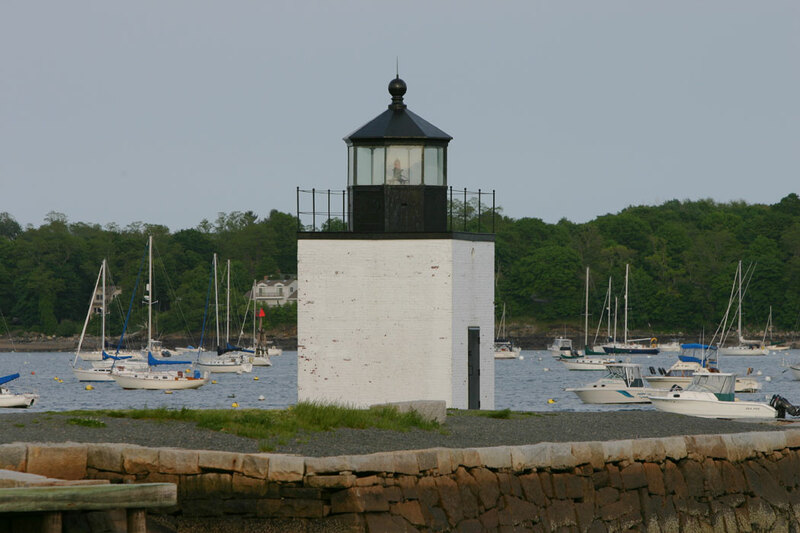 A small state with a long coastline and many harbors, Massachusetts has a large number of lighthouses. 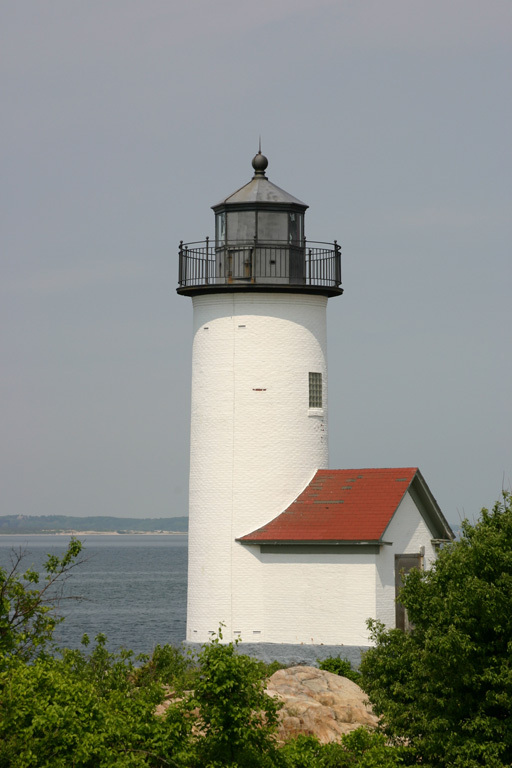 This page lists the lighthouses of the northern part of the state, including Newburyport, the Cape Ann area, Massachusetts Bay and Boston Harbor, and the Plymouth area. 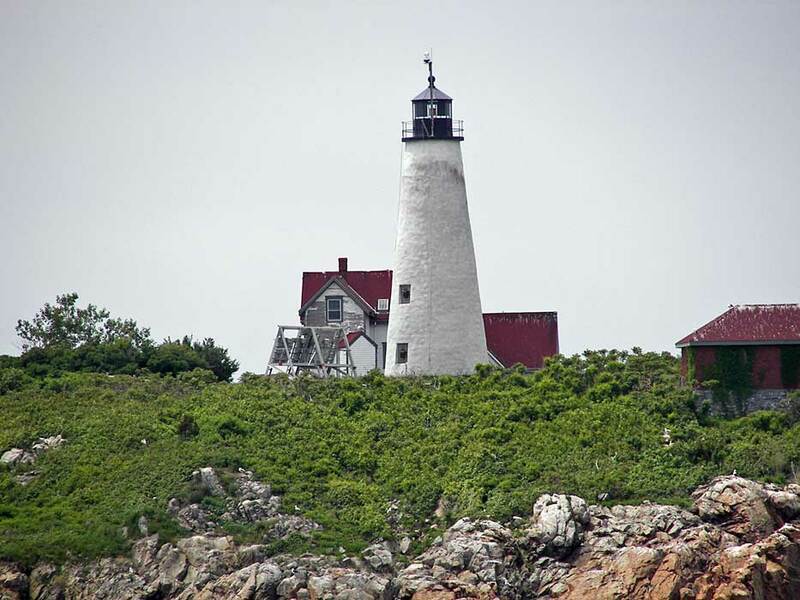 Lighthouses of Cape Cod, Nantucket, Martha's Vineyard, and the south coast are on the Southeastern Massachusetts page. Boston is the largest port of the New England states, and the Cape Ann area includes several historic and busy fishing ports. Many of the lighthouses of this region are famous. 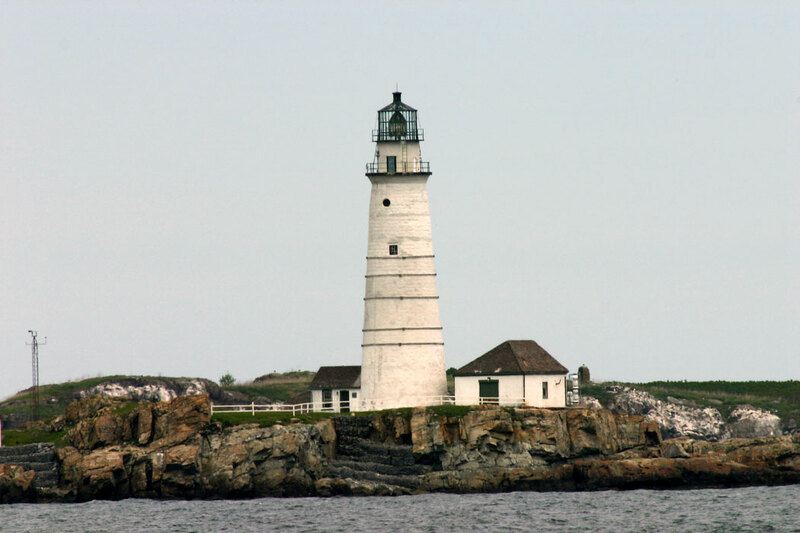 The Boston Harbor Light is the second oldest U.S. lighthouse and the oldest U.S. light station. Although there is no state preservation society, there are many local societies. There have been substantial preservation efforts at many lighthouses in recent years, although several towers remain in need of attention. Jeremy D'Entremont's book, The Lighthouses of Massachusetts (Beverly, Mass. : Commonwealth Editions, 2007) is an indispensible resource for information on these lighthouses. 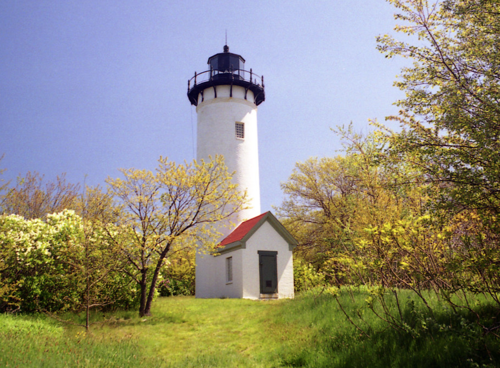 Navigational aids in Massachusetts are operated by the U.S. Coast Guard First District, but ownership (and sometimes operation) of historic lighthouses has been transferred to local authorities and preservation organizations in many cases. Data and photos for all of the lighthouses; an outstanding resource created by Jeremy D'Entremont. Photos, travel directions, and historical accounts from Kraig Anderson's Lighthouse Friends site. From Bill Britten's Lighthouse Getaway site: fine photos of many of the state's better-known lighthouses. Photos and accounts by Gary Richardson and Anna Klein; part of their Cyberlights site. Note: Newburyport is a town of about 17,500 residents located on the Merrimack River. The town has a long maritime tradition and is the site of Coast Guard station. 1873. Inactive since 1961. 53 ft (16 m) square tapered red brick tower with lantern and gallery, attached to a 2-story wood keeper's house. The tower is unpainted on three sides; the side facing the river is painted white. Lantern and gallery painted black. The keeper's house is used for offices. Robert English has a good closeup photo, Anderson's page also has good closeup photos, and Google has a street view and a satellite view. The Lighthouse Preservation Society has reached an agreement with the owner, developer David Hall, to have the structure restored and interpreted. LPS is offering the tower for dinners for two at $350 with half going to the preservation fund. Located at 61-1/2 Water Street near Independent Street in downtown Newburyport, about 0.4 mile (650 m) east of US 1. Site open; tower closed, except for those with dinner reservations. Owner/site manager: private. ARLHS USA-545. 1873. Inactive since 1961. 15 ft (4.5 m) round cast iron tower with lantern and gallery, painted white; lantern roof is red. The lantern is a restoration (1990). Robert English has a good closeup photo, Anderson has a good page for the lighthouse, Google has a street view and a satellite view. 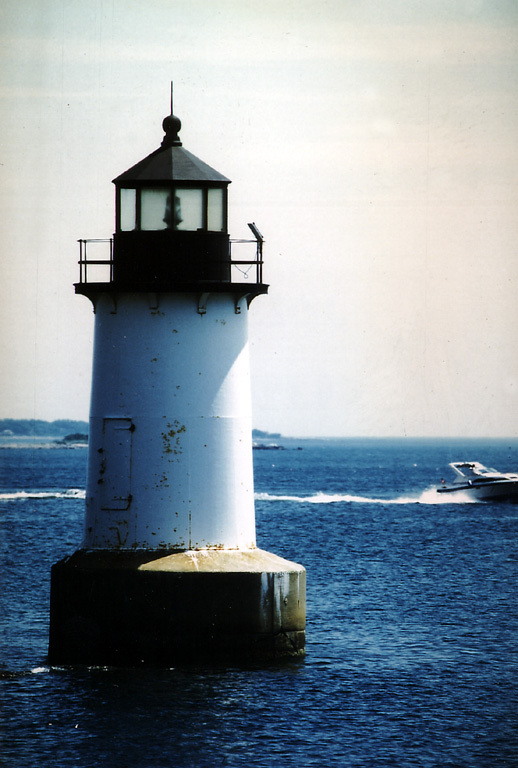 The lighthouse was relocated in 1964 from Bayley's Wharf to the grounds of the Merrimack River Coast Guard Station . In 1901 the original lantern was removed and the tower was extended with an octagonal wood tower, later raised to a total tower height of 35 ft (11 m). Sometime in the 1990s the wood tower was damaged by fire; the Coast Guard then removed the wooden extension and added the replica of the original lantern. In 1999 the Coast Guard agreed to lease the tower to the Lighthouse Preservation Society for full restoration and interpretation. Campbell Construction Group performed some renovation in late 2001. Located on the waterfront between Federal Street and Independent Street, about 350 ft (100 m) east of the rear light. Site open, tower closed. Owner: U.S. Coast Guard. Site manager: Lighthouse Preservation Society. ARLHS USA-1097. 1898 (station established 1788). Active; focal plane 50 ft (15 m); green light, occulting twice every 15 s (occultations separated by 4 s). 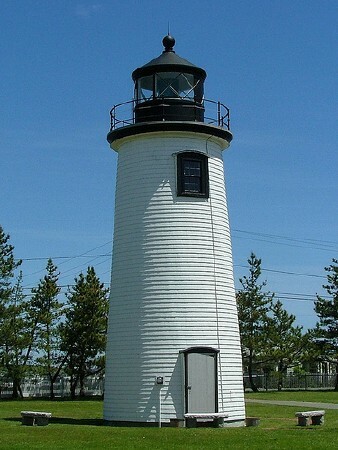 45 ft (13.5 m) round wood-shingled tower with lantern and gallery, 4th order Fresnel lens (1856, transferred from the 1838 tower) in use. 2-story wood keeper's house (1898). Larry Myhre's photo is at right, Anderson has a fine page for the lighthouse, Trabas has a closeup photo, Marinas.com has aerial photos, Huelse has a historic postcard view, and Google has a street view and a satellite view. The original keeper's house was for a long time the headquarters of the Parker River National Wildlife Refuge. 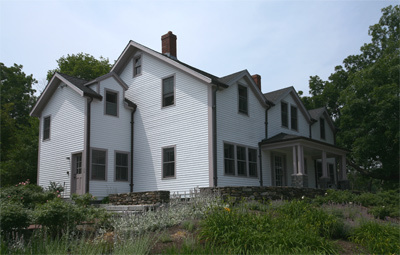 A new Refuge headquarters and visitor center was completed in 2004 and the keeper's house now houses refuge interns. 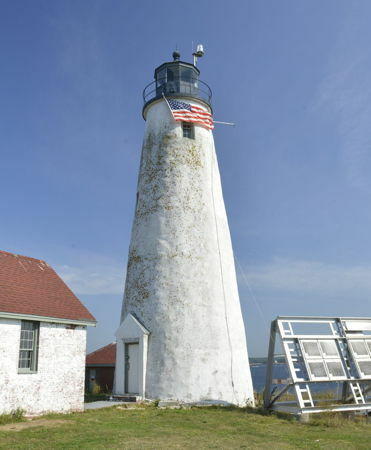 A local support group, Friends of Plum Island Light, Inc., leased the lighthouse from the Coast Guard in 1996 and has been working ever since to maintain and restore the lighthouse. Ownership of the lighthouse was conveyed to the City of Newburyport in May 2003 and Friends of Plum Island Light now leases the tower from the city. They hope to acquire the keeper's house as a museum and visitor center. The tower was renovated in 1994 and re-shingled in 1997 by the Coast Guard. In 2016 the Friends group was seeking $12,000 in funding to repaint the tower and replace two windows. Located near the end of Northern Boulevard, at the north end of Plum Island on the south side of the Newburyport Harbor entrance. Parking may be crowded in the summer. Site open; tower open for tours on selected dates in the summer. Owner: City of Newburyport. Site manager: Friends of Plum Island Light. ARLHS USA-544; Admiralty J0250; USCG 1-0260. Date unknown (station established 1837). Active; focal plane 30 ft (9 m); white light occulting once every 4 s. Approx. 20 ft (6 m) square skeletal mast carrying two diamond-shaped daymarks covered in a red and white checkerboard pattern. Trabas has a closeup photo, Leonardo Dasilva has a street view, and Google has an indistinct satellite view. A pair of brick range lighthouse were built here in 1837. In the 1860s the front lighthouse was replaced by a small wood tower that could be moved easily as the channel line evolved. The rear lighthouse was replaced by a cast iron lighthouse in 1881. The front light was discontinued and removed in 1932. In 1939 the rear light was relocated by barge to Edgartown on Martha's Vineyard, where it continues in service today (see the Southern Massachusetts page). Located on the dunes at the Crane Beach Parking Area, south of the entrance to Plum Island Sound. Parking may be crowded in the summer. Site open, tower closed. Site manager: The Trustees of Reservations (Crane Beach on the Crane Estate). ARLHS USA-403 (front light) and 1113 (rear light); Admiralty J0266; USCG 1-9315. Note: Cape Ann is a prominent rocky peninsula projecting into the Atlantic at the northern edge of Massachusetts Bay. Most of the cape is in the city of Gloucester. The town of Rockport occupies the tip of the cape. 1897 (station established 1801). Active; focal plane 45 ft (13.5 m); white flash every 7.5 s (red sector). 41 ft (12.5 m) round cylindrical brick tower with lantern and gallery, attached to a workroom; 190 mm lens (1988). Tower painted white; lantern is black. The historic 1-1/2 story wood keeper's house (1801) is used as Coast Guard housing. Fog horn (2 blasts every 60 s). Stone oil house. The tower is connected to shore by a wooden walkway. A photo is at right, Anderson has a good page for the lighthouse, Trabas has a photo, HaoCheng Tsai has a 2017 photo, Marinas.com has aerial photos, Huelse has a historic postcard view, and Google has a street view and a satellite view. Sibling of Eastern Point Light (see below). In 2000 the Coast Guard funded major restoration of the tower, repairing interior ironwork, replacing windows, and repointing the brickwork, which required replacing about 3000 bricks. Lighthouse Digest reported on this restoration in September 2000. Located on Wigwam Point, off MA 127, at the entrance to Annisquam Harbor in Gloucester. Site and tower closed but the lighthouse can be seen from the street. There is limited parking close to the light. Owner/site manager: U.S. Coast Guard. ARLHS USA-015; Admiralty J0268; USCG 1-9615. 1896 (station established 1835). Active; focal plane 46 ft (14 m); green flash every 6 s. 37 ft (11 m) round cylindrical brick tower with lantern and gallery, attached to a workroom, 250 mm lens. Tower painted white; lantern is black. Fog horn (blast every 15 s). The 1-1/2 story Gothic wood keeper's house (1878) is boarded up and near collapse. Anderson's page has several photos, Robert English has a photo that also shows the Thatcher Island lighthouses (next entries), the house is also seen in Dennis Ebacher's 2011 photo, Trabas has Andreas Köhler's photo, Marinas.com has aerial photos, and Google has a satellite view. Sibling of Eastern Point Light. The Massachusetts Audubon Society manages the island. For many years the Society opposed public access and allowed the buildings to deteriorate. Because of the condition in the keeper's house the station was placed on the Lighthouse Digest Doomsday List. In 2001 the Lighthouse Preservation Society proposed to relocate the keeper's house to Newburyport, but nothing came of this idea and the building appeared doomed. In 2008 the lighthouse became available for transfer under NHLPA. 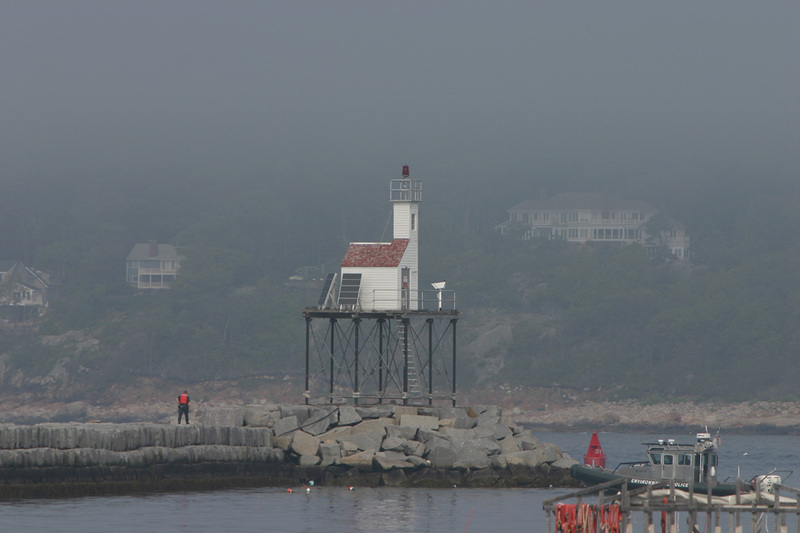 The Town of Rockport agreed to apply for ownership of the lighthouse, with the Thacher Island Association as manager; the association has a page for the lighthouse. In July 2009 the town's application for ownership was approved and the transfer took place in 2010. In 2014 the town signed a 30 year lease with Massachusetts Audubon for the keeper's house and oil house. Restoration of the lighthouse and keeper's house was being completed in 2018; in August work began on a dock that will permit visitor access. Tours of the island and light station are expected to begin in summer 2019. Located on Straitsmouth Island, off Gap Head in Rockport; there is a distant view from the Rockport waterfront. Site and tower closed (bird sanctuary). Owner (tower) and lessee (keeper's house): Town of Rockport. Site manager: Thacher Island Association. ARLHS USA-815; Admiralty J0274; USCG 1-0290. 1861 (station established 1771). Reactivated (inactive 1932-1989, now maintained by the Thatcher Island Association); focal plane 166 ft (50.5 m); continuous yellow light. 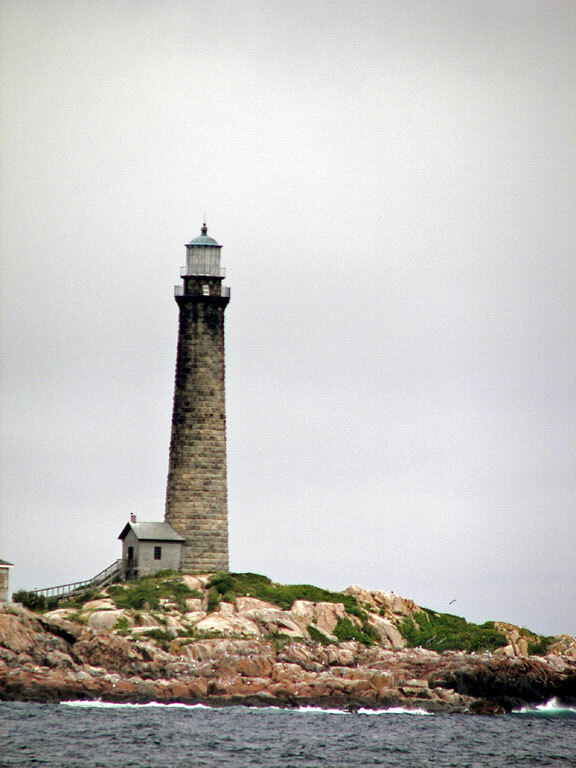 One of a pair of 124 ft (38 m) unpainted round granite towers with lantern and gallery, siblings of Maine's Boon Island Light. 200 mm lens. C.M. Hanchey's photo is at right, Anderson has a fine page for the light station, Trabas has Michael Boucher's photo, Zac Peterson has a 2017 photo, Huelse has a historic postcard view, and Google has a satellite view. 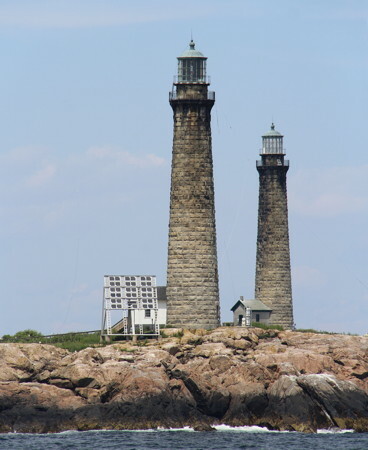 The two Thacher Island towers are the tallest Massachusetts lighthouses. The north tower was restored by the International Chimney Corporation in 1988-89. In 2016 a granite block fell from under the gallery. In 2018 International Chimney reinstalled that block and installed steel bands under the galleries of both lighthouses to prevent similar problems in the future. 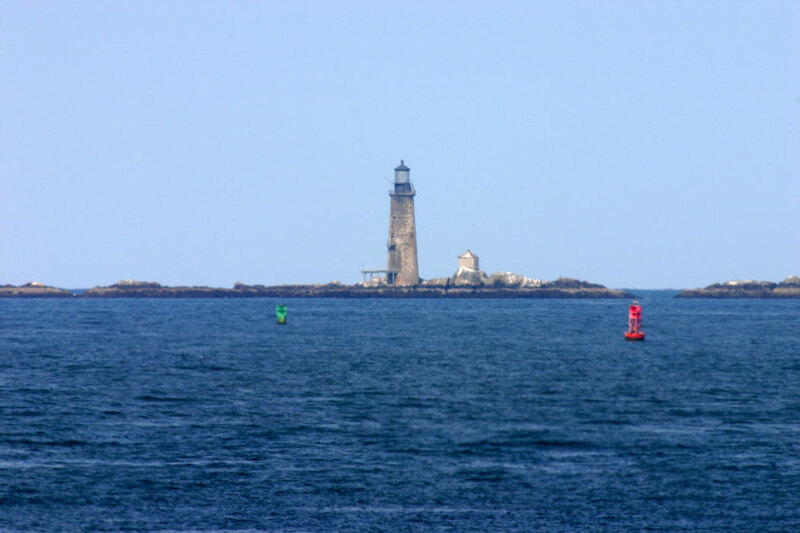 Located at the north point of Thacher Island, which is about 1/2 mi (800 m) off the tip of Cape Ann in Rockport. The northern part of the island is the Thacher Island National Wildlife Refuge. Accessible only by boat; tours are available on Wednesdays and Saturdays mid June through August 31 (reservations required). Guest moorings are also available (call ahead). Located at the north end of the island. Site open, tower closed. Owner: U.S. Fish and Wildlife Service. Site manager: Thacher Island Association. ARLHS USA-1027; Admiralty J0277; USCG 1-0305. 1861 (station established 1771). 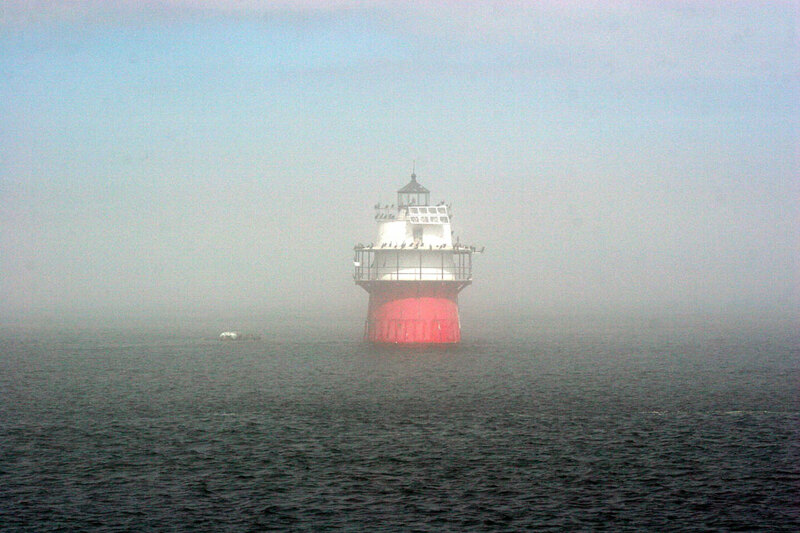 Active; focal plane 166 ft (50.5 m); red flash every 5 s. One of twin 124 ft (38 m) unpainted round granite towers with lantern and gallery, siblings of Maine's Boon Island Light. 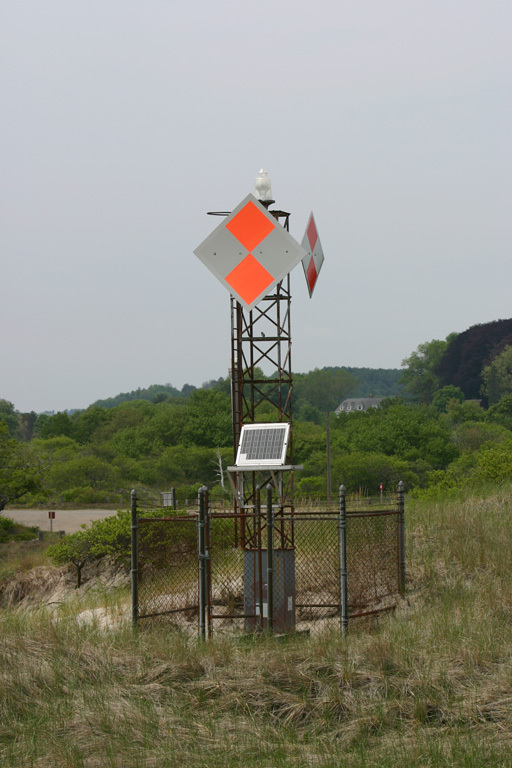 Solar-powered VRB-25 aerobeacon; the original 1st order Fresnel lens was restored and is on display at the Cape Ann Museum in Gloucester. Fog horn (2 blasts every 60 s). C.M. Hanchey's photo is at right, Anderson's excellent page has photos, Trabas has Michael Boucher's photo, Doug Ellis has a 2017 photo of the island and both lighthouses, Marinas.com has fine aerial photos, and Google has a satellite view. 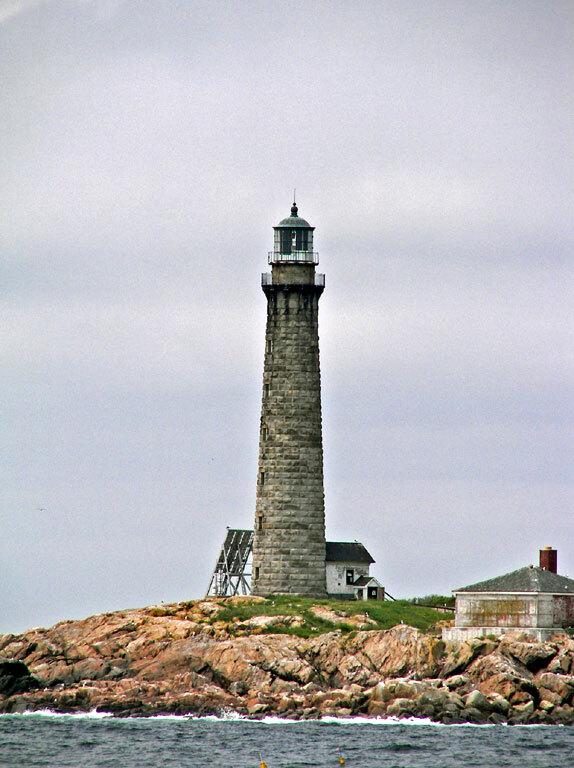 The two Thacher Island towers are the tallest Massachusetts lighthouses. 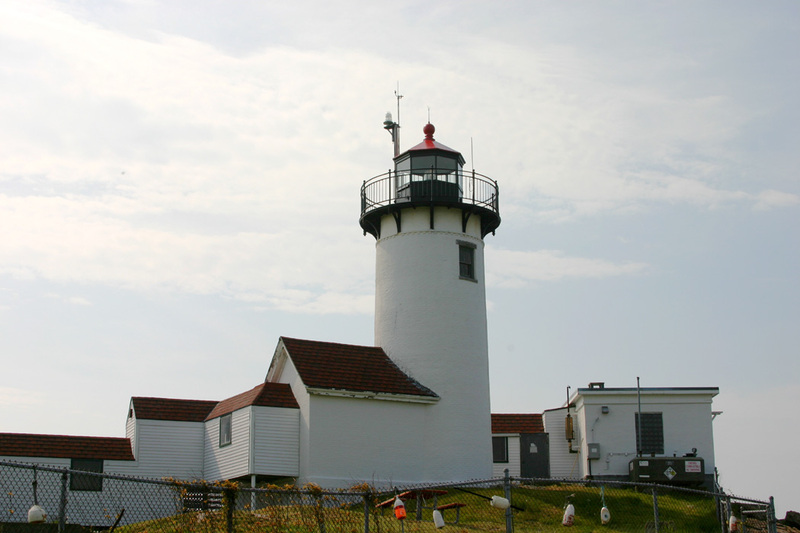 In 2001 Cape Ann became the ninth light station recognized as a National Historic Landmark and in August 2001 the Coast Guard transferred ownership of the south tower and the southern half of the island to the Town of Rockport. Ongoing restoration efforts are returning this historic light station to its late 19th century appearance. The boat ramp was rebuilt in 2000 and renovation of the assistant keeper's house was completed in 2002. Restoration of the principal keeper's house was completed in 2007. The principal keeper's house now houses resident caretakers. 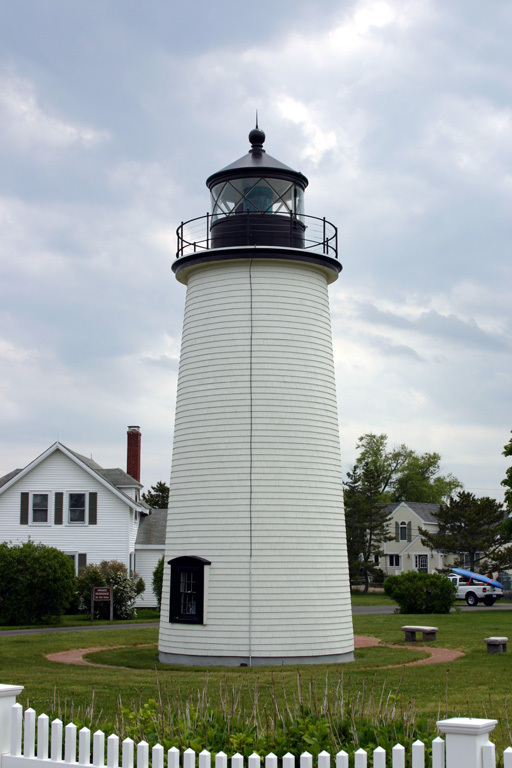 In December 2012 it was announced that the historic 1st order lens would be restored for display at the Cape Ann Museum; the installation of the lens took place in May 2013. Accessible only by boat; tours are available on Wednesdays and Saturdays late June through August 31. Guest moorings are also available (call ahead). Located on the southeast side of the island. Site open, tower closed. Owner: Town of Rockport. Site manager: Thacher Island Association. ARLHS USA-105; Admiralty J0276; USCG 1-0295. Note: The City of Gloucester has a historic connection to the sea; it has always been the principal base for the state's fishing fleets. The city occupies most of the Cape Ann peninsula and the village of Annisquam (see above) is also part of the city. 1890 (station established 1832). Active; focal plane 57 ft (17.5 m); white flash every 5 s, day and night. 36 ft (11 m) round brick tower with lantern and gallery, DCB-36 aerobeacon. The original 4th order Fresnel lens is on display at the Cape Ann Museum in Gloucester. Fog horn (blast every 10 s) on demand. Tower painted white; lantern is black with a red roof. The 2-story duplex Victorian keeper's house (1879) is used as Coast Guard housing. The oil house (1894) and assistant keeper's house (1908) are also preserved. A fog bell used 1933-1969 is displayed on the grounds. A photo is at right, David Gandy has a closeup, Anderson has a good page with several photos, Trabas has a closeup photo, Marinas.com has aerial photos, Huelse has a historic postcard view, Joe Zimmerman has a street view of the station, and Google has a satellite view. The Coast Guard renovated the tower in 1993. 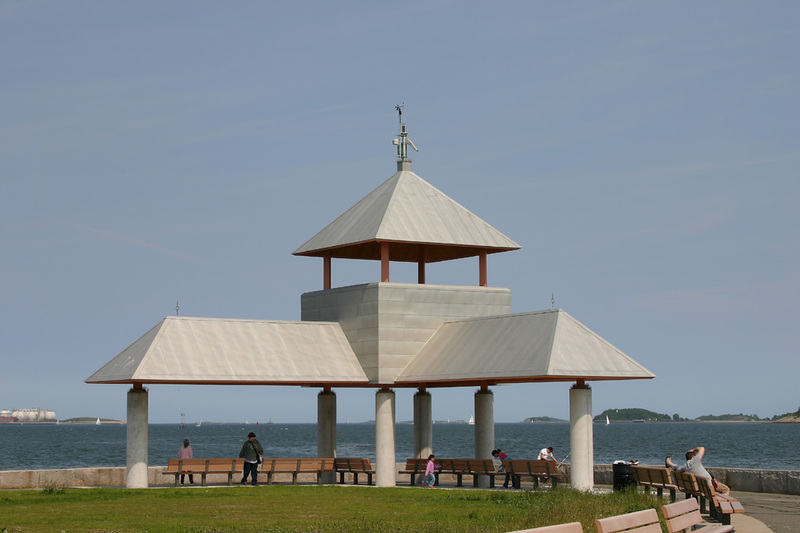 Located at the end of Eastern Point Boulevard in Gloucester, on the east side of the entrance to Gloucester Harbor. Site and tower closed, but there is public parking close to the light and good views from the nearby breakwater. Owner/site manager: U.S. Coast Guard. ARLHS USA-263; Admiralty J0280; USCG 1-0330. 1905. 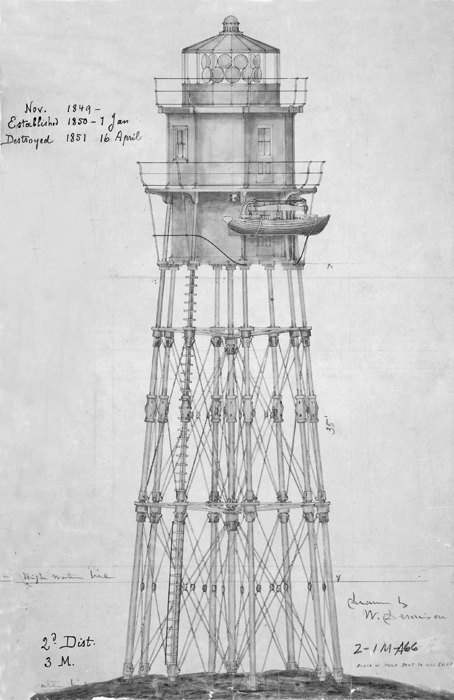 Active; focal plane 45 ft (13.5 m); red light occulting every 4 s. 37 ft (11 m) chimney-like square cylindrical wood tower attached to an oil shed, mounted on a platform supported by nine iron piles. The tower is white; oil shed roof is red. Fog horn (blast every 10 s). Original lantern replaced by the red navigation beacon. Trabas has a foggy photo, Eric Brumble has a view from the sea, Patrick O'Leary has a closeup street view, and Google has a satellite view. This minor light was formerly lit by the Eastern Point Light keeper. Located at the end of the 2250 ft (685 m) Dog Bar Breakwater at Eastern Point in Gloucester. Accessible in fair weather only by walking the narrow breakwater. Site open, tower closed. Owner/site manager: U.S. Coast Guard. ARLHS USA-969; Admiralty J0282; USCG 1-9855. 1881 (station established 1821). Reactivated (inactive 1956-1989); focal plane 57 ft (17.5 m); red light, 3 s on, 3 s off. 30 ft (9 m) round cast iron tower (brick lined) with lantern and gallery, 250 mm lens. Tower painted white, lantern and gallery black. 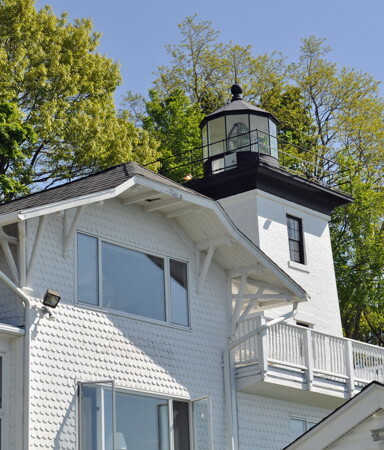 The original 5th order Fresnel lens is at the Maine Lighthouse Museum in Rockland, Maine. Fog horn (2 blasts every 20 s) on demand. Keeper's house demolished in 1956. Anderson's page has good photos, Trabas has a photo, Mark Gafur has a 2017 photo, Marinas.com has aerial photos, Huelse has a historic postcard view, and Google has a satellite view. This lighthouse is familiar from the paintings of Winslow Homer, who boarded with the keeper for the summer of 1880. The lighthouse was restored through efforts of the Lighthouse Preservation Society in 1989. The oil house was restored in 1995. Located on an island in the middle of Gloucester Harbor. The city maintains walking paths to the lighthouse. Island accessible only by boat, and there are no landing facilities; water taxis available in season. Site open, tower closed. Owner/site manager: City of Gloucester. ARLHS USA-839; Admiralty J0284; USCG 1-9895. Note: Salem is a historic seaport on the north shore of Massachusetts Bay. From the 1790s through the 1850s its fast clipper ships traded all around the world. The Salem Maritime National Historic Site preserves some of this history. The modern city has a population of about 45,000. 1820 (station established 1798). Active; focal plane 111 ft (34 m); flash every 10 s, alternating red and white. 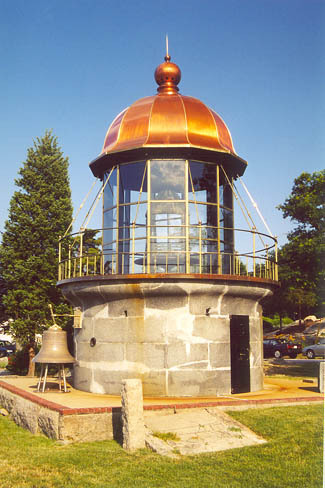 59 ft (18 m) round old-style granite tower with lantern and gallery, solar-powered rotating 190 mm lens. Tower painted white, lantern and gallery black. Fog horn (blast every 30 s). 1-1/2 story Victorian wood keeper's house (1878) and assistant keeper's house. A brick fog signal building and rubblestone oil house survive in good condition. The 4th order Fresnel lens (1855) is on display at the Maine Lighthouse Museum in Rockland, Maine. Brick fog signal building (1907). A Coast Guard photo is at right, Anderson has a good page for the lighthouse, Trabas has a good photo by Michael Boucher, Marinas.com has aerial photos, and Google has a satellite view. This is a historic and well-preserved light station with an outstanding example of an old-style stone light tower. The station had two wood towers originally. In 1815 both were heavily damaged by a storm, and they were replaced by a single octagonal stone lighthouse. The present round tower was added in 1820. The 1815 tower was deactivated and demolished in 1926. Huelse has a historic postcard view showing the two towers. Major restoration work to the 1820 tower was done in 1996. In 2000 the Coast Guard solarized the light and restored the fog signal building. 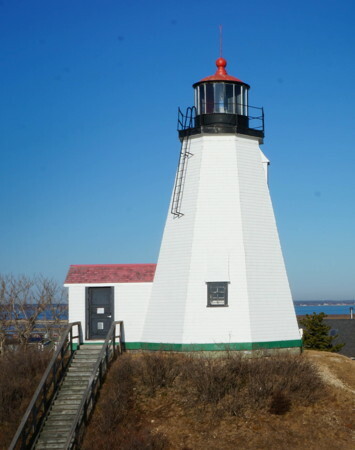 In 2002 the light station was listed for transfer under the National Historic Lighthouse Preservation Act and in 2005 transfer of ownership to the Essex National Heritage Commission was approved. This transfer was challenged in court by a group of island landowners who had organized as the Baker's Island Lighthouse Preservation Society; they feared that transfer to ENHC would lead to public access to the island. In October 2006 a judge ruled against the society, apparently clearing the way for the transfer to take place. But there were many more years of delay ahead and the transfer did not take place until August 2014 (the photo at right was taken at the transfer ceremony). The landowners will not allow use of their dock, but in July 2015 the Society began offering tours using a landing craft that can deliver visitors to the beach near the lighthouse. In addition, visitors can stay overnight in the assistant keeper's house on Thursday, Friday or Saturday nights mid June through early September. The exterior of the lighthouse was restored in 2015, funded by a grant from the Daughters of the American Revolution. Located at the north end of Baker's Island, about 5 km (3 mi) east of the entrance to Salem Harbor. 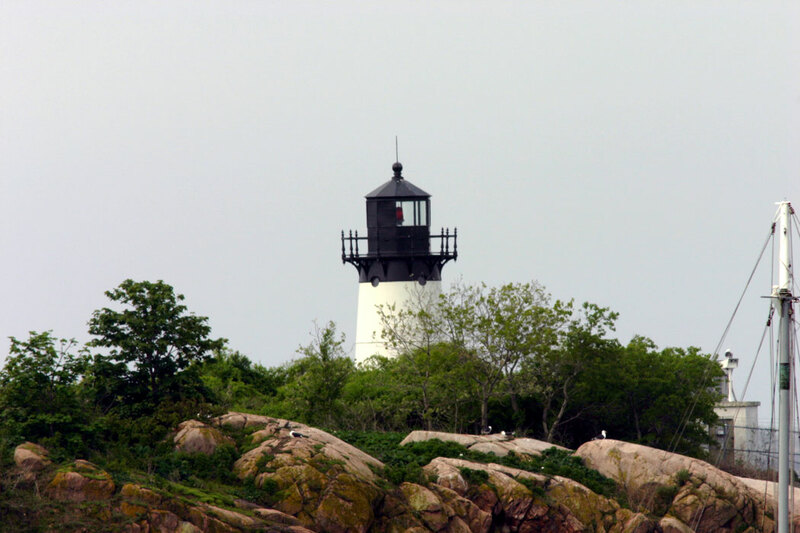 Accessible only by boat; visible from many points in Salem and Marblehead. Site generally closed but open to guided tours from the Salem Ferry Dock Friday through Sunday June through September. Capacity is limited, so reservations are advised. Owner:/site manager: Essex National Heritage Commission (Baker's Island Light Station). ARLHS USA-031; Admiralty J0288; USCG 1-0350(=1-9975). Date uncertain. This was a 30 ft (9 m) pyramidal granite tower topped by red and white diamond-shaped daymarkers. A photo is available and Google has a satellite view. Although the ledge is popularly associated with the famous navigator Nathaniel Bowditch, it is actually named for William Bowditch, Nathaniel's great-grandfather, who wrecked his ship Essex Galley on the ledge in 1700. Sadly, the historic beacon suddenly collapsed overnight in late November 2018. Ruins are visible at very low tides. Located about 1 mile west of Baker's Island and 1 mile southeast of Allen Head. Accessible only by boat. Site and tower closed. Owner/site manager: U.S. Coast Guard. USCG 1-10025. 1872. Active; focal plane 70 ft (21 m); continuous white light, higher intensity on the range line. 45 ft (13.5 m) square brick tower with lantern and gallery, attached to a 2-story Queen Anne wood keeper's house (1871, modified 1968). Tower painted white, lantern and gallery black. Buildings floodlit at night. 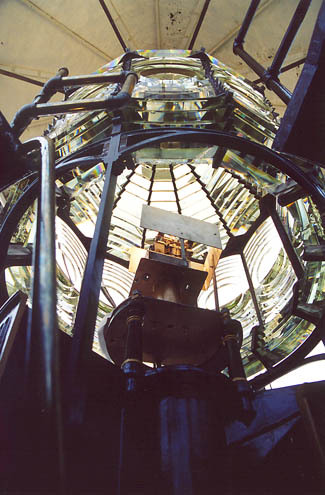 The original 3-1/2 order Fresnel lens remains in use; a rare "condensing panel" intensifies the light along the range line. Original brick oil house. Fog bell mounted in front of the house but not in use. The keeper's house is the residence of the Commander of the First Coast Guard District. A photo is at right, Robert English has a good photo, Anderson's fine page for the lighthouse has several photos, Trabas has a closeup photo, Huelse has a historic postcard view, Blane Granstaff has a street view, and Google has a satellite view. The range guides vessels into Salem Sound along a line north of Baker's Island and Bowditch Ledge. Located at the end of Bay View Avenue (continuation of East Corning Street), off MA 127 in Beverly, on the north side of the entrance to Beverly Harbor. Limited on-street parking at the end of the street. Site and tower closed except for an annual open house, but parking is available nearby. Owner/site manager: U.S. Coast Guard. ARLHS USA-389; Admiralty J0290; USCG 1-10000. 1927. Active; focal plane 183 ft (56 m); continuous white light visible only along the range line. Light displayed through a square opening in the steeple of the First Baptist Church in Beverly. A 2010 photo shows the square opening well, Trabas has a photo showing the tower being repainted, Google has a street view, and Bing has an aerial view. 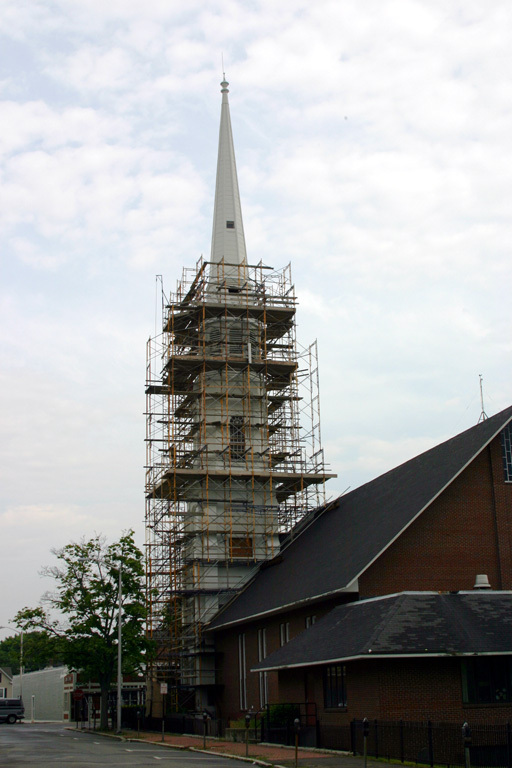 The church was largely destroyed by fire in August 1975 but the steeple remained standing and a new building was built around it. Located at Cabot and Abbott Streets in downtown Beverly, 2050 ft (625 m) west of the front range light. Site open, tower closed. Owner/site manager: First Baptist Church in Beverly. ARLHS USA-390; Admiralty J0290.1; USCG 1-10005. 1871. Reactivated (inactive 1969-1983, now maintained by the city of Salem); focal plane 28 ft (8.5 m); white flash every 4 s. 32 ft (9.5 m) round cast iron tower with lantern and gallery, solar-powered ML-300 lens (1994). Tower painted white, lantern and gallery black. 1-1/2 story Victorian wood keeper's house. Igor Motov has an excellent photo, Trabas has a closeup by Klaus Potschien, Anderson's page for the lighthouse also has good photos, Google has a street view, and Bing has an aerial view. The Fort Pickering Light Association saved the abandoned lighthouse and worked for restoration and maintenance of the tower. The lantern and ironwork were restored in 1999. The light failed in July 2009; after some partially-successful efforts by the city to relight it the Coast Guard installed a rebuilt solar-powered system in February 2010. 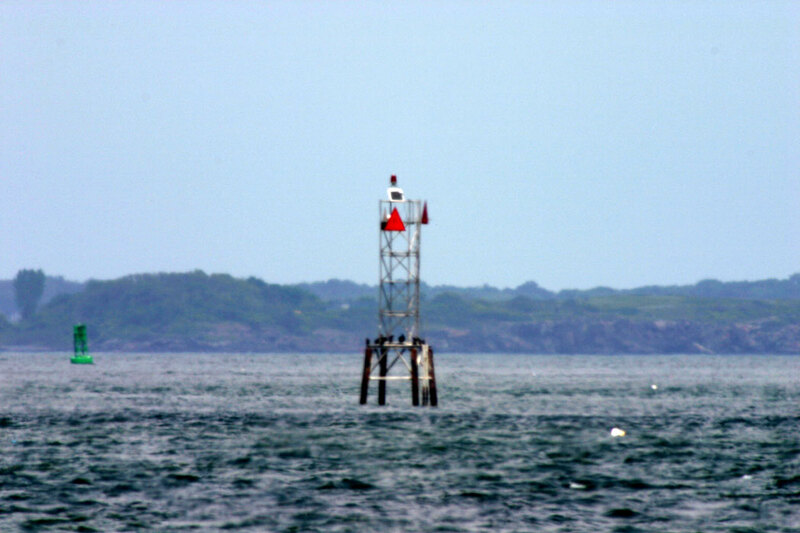 Located just offshore of Winter Island (now a peninsula) on the north side of the entrance to Salem Harbor. Site and tower closed, but lighthouse can be closely approached (parking fee for non-residents). Owner/operator: City of Salem. Site manager: Winter Island Marine Park. ARLHS USA-901; Admiralty J0294; USCG 1-10090. 1871. 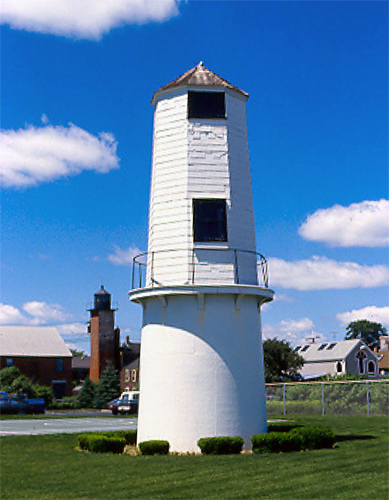 Reactivated (inactive 1977-1983; now maintained by the National Park Service); focal plane 25 ft (7.5 m); red flash every 6 s. 14 ft (4 m) square cylindrical brick tower with lantern and gallery, painted white; lantern black. Anderson's page for the lighthouse has good photos, Trabas has a closeup, Google has a street view, and Bing has a satellite view. Google also has a distant street view of the light behind the replica tall ship Friendship. This is probably the smallest traditional U.S. lighthouse. There was never a keeper's house for this light; keepers lived in their own houses in town and walked to work. Nearly 1/2 mile (800 m) long, the wharf was the traditional heart of Salem Harbor. A disastrous fire in 1914 destroyed most of the wharf but the lighthouse survived. 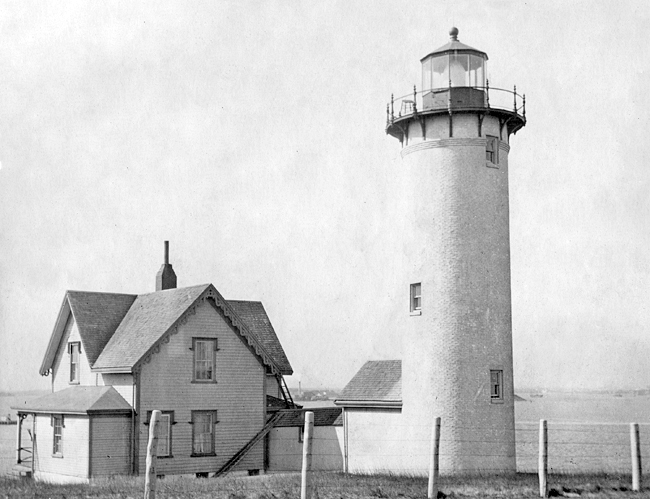 The Coast Guard deactivated the light in 1977 and transferred the building to the park service in 1979. The Friends of Salem Maritime National Historic Site assist with restoration and maintenance. Located at the end of the wharf; accessible by an easy walk along the pier. Site open, tower closed. Owner/operator: U.S. National Park Service. Site manager: Salem Maritime National Historic Site. ARLHS USA-224; Admiralty J0296; USCG 1-10129. Note: Marblehead is a town of about 20,000 residents. Formerly a shipbuilding center, its harbor is now used mostly by recreational craft. 1896 (station established 1835). Active; focal plane 130 ft (40 m); continuous green light. 105 ft (32 m) square pyramidal skeletal tower with central cylinder, lantern, and double gallery; 300 mm lens. Tower is painted light brown, lantern and watch room black. The keeper's house was demolished in the 1960s; the brick oil house survives. Adam Witwer's photo is at right, Brian Birke has a good 2008 photo, Anderson has a fine page for the lighthouse, Trabas has a good photo, Huelse has a historic postcard view, and Google has a street view and a satellite view. 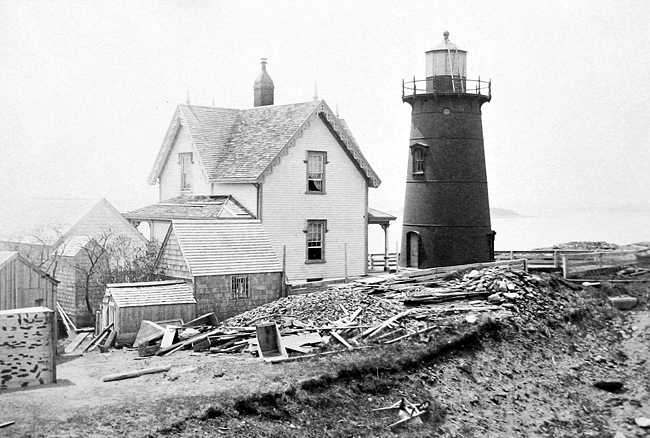 The original lighthouse was the 23 ft (7 m) round stone tower seen in a panoramic 1895 photo. 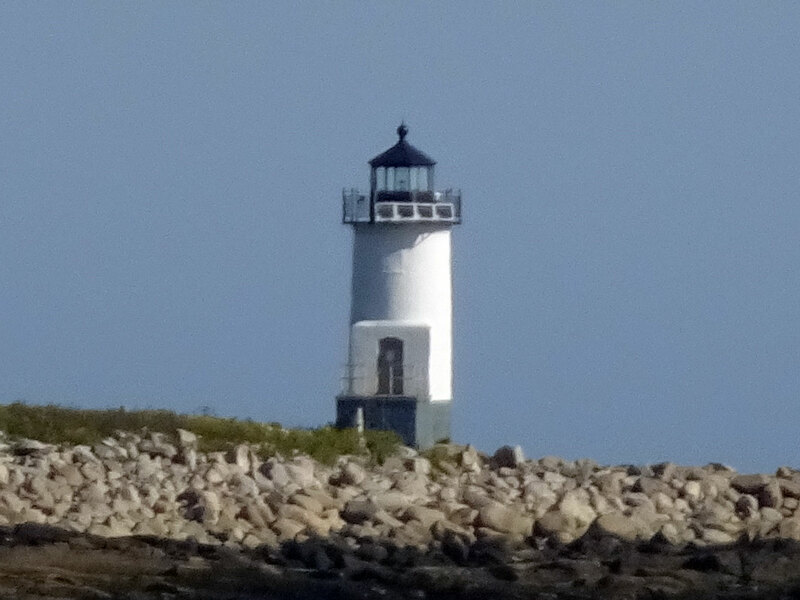 The current lighthouse is of the "Sanibel" class of skeletal lighthouses, a design seen mostly in the southeastern states; it is the only lighthouse of its kind in New England. In 1947 Chandler Hovey purchased the land surrounding the lighthouse and donated it to the town as a park that now bears his name. 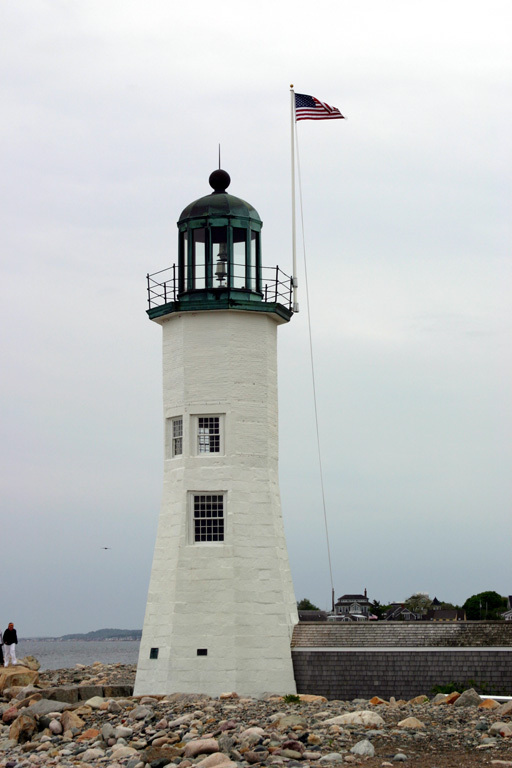 A rededication ceremony for the light was held at the lighthouse in September 2002. The town maintains the lighthouse under a license from the Coast Guard. 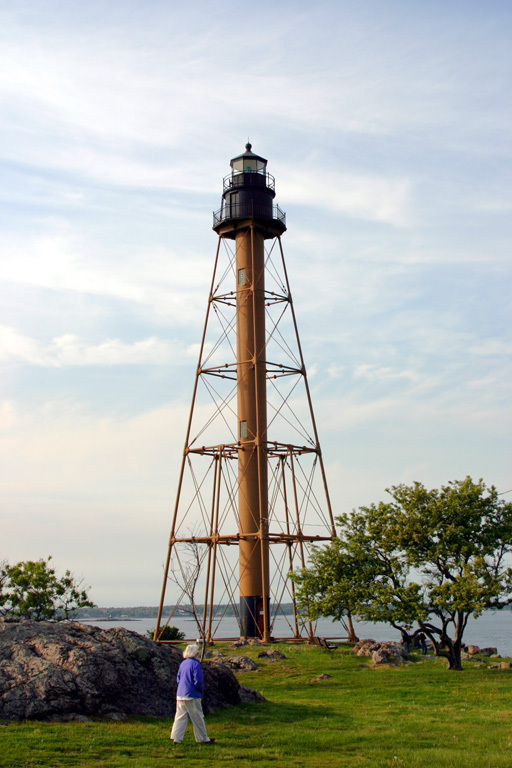 Located on Lighthouse Point at the northern tip of Marblehead Neck. Site open (city park), tower closed. Owner: U.S. Coast Guard (tower only). Site manager: Town of Marblehead (Chandler Hovey Park). ARLHS USA-473; Admiralty J0304; USCG 1-10450. Note: Boston is by far the largest city of the New England states with an estimated population of 685,000 in the city limits and a metropolitan population of nearly 5 million. Founded in 1630, it is one of the oldest and most historic cities of the U.S.
1905 (Royal Luther). Active; focal plane 98 ft (30 m); 2 white flashes every 12 s, day and night. 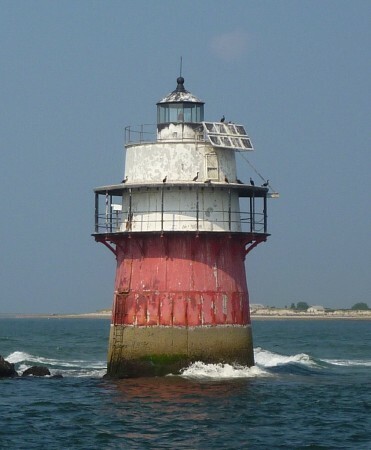 113 ft (34.5 m) unpainted round granite waveswept tower with lantern and gallery, incorporating keeper's quarters; solar-powered VRB-25 aerobeacon (2001). Lantern painted black. Fog horn (2 blasts every 20 s). The original 1st order Fresnel lens is reported to be in storage at the Smithsonian Institution in Washington, DC. David Smith's photo is at right, Tiffany Lanceleve has a portfolio of 2013 photos, a closeup 2007 photo is available, Anderson has a good page with several photos, Trabas has a distant view, Lighthouse Digest has Jeremy D'Entremont's article with the history of the lighthouse, Marinas.com has aerial photos, Huelse has a historic postcard view, Joshua Miller has a 2015 street view, and Google has a satellite view. It took two years to construct a lighthouse on this difficult site. Keepers maintained the light until it was automated in 1976; the light was converted to solar power in 2001. The General Services Administration began an auction sale of the lighthouse in June 2013. After spirited bidding the lighthouse sold on August 31 for $933,888, more than double the previous record for a GSA lighthouse auction. The owner is Dave Waller, a Boston businessman. Waller is restoring the tower with the help of volunteers; he has a web site detailing his efforts. Located on a tiny island adjacent to the Boston North Channel east of Winthrop; this island is included in the Boston Harbor Islands National Recreation Area. 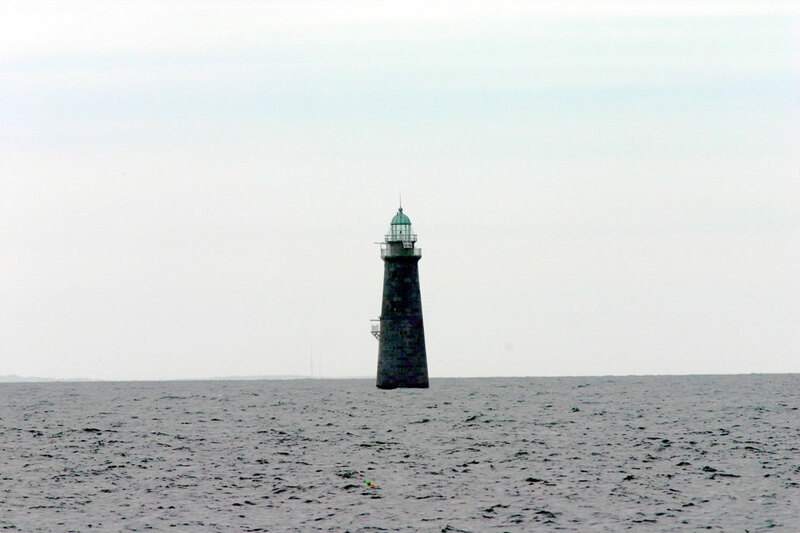 The entrance to Boston for larger vessels is to the north of this lighthouse. Accessible only by boat, but landing on the privately-owned island is not allowed and would be strongly discouraged in any case due to the dangerous surf and tide conditions. Friends of the Boston Harbor Islands arranges boat tours passing near the site. Site and tower closed. Owner/site manager: Graves Light Station . ARLHS USA-341; Admiralty J0310; USCG 1-0390(=1-10679). 2015 (station established 1890). Active; focal plane 53 ft (16 m); flash every 5 s, alternating red and white. 33 ft (10 m) square skeletal tower mounted on a platform supported by piles. Fog horn (blast every 10 s). Anderson has a photo. The original lighthouse here was a cast iron sparkplug tower seen in Huelse's postcard view and the Coast Guard's historic photo. 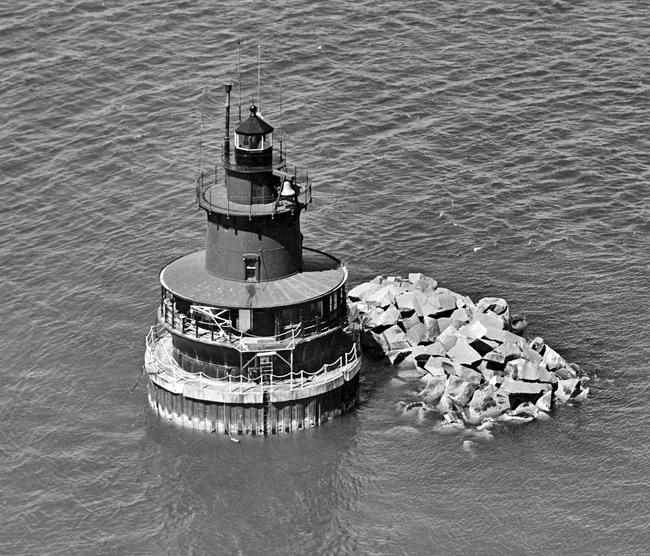 It was demolished in 1982 and replaced by a round barbell-shaped brown fiberglass tower mounted on the foundation of the sparkplug lighthouse. Anderson's page also has good photos, Trabas has a closeup, Lighthouse Digest has an article with the history of the lighthouse, and Google has a satellite view. 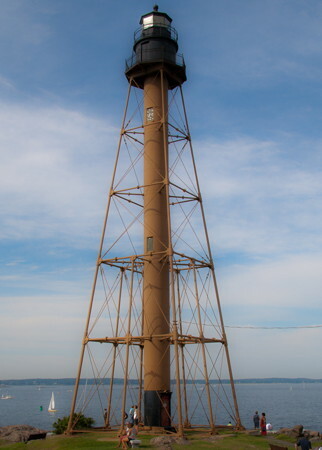 The 1982 light was the first fiberglass lighthouse installed in the U.S. Deer Island is included in the Boston Harbor Islands National Recreation Area. Located in the entrance to Boston's Inner Harbor off the southern end of Deer Island. Visible from the Massachusetts Water Resources Authority plant on Deer Island. Accessible only by boat. Site and tower closed. Owner/site manager: U.S. Coast Guard. ARLHS USA-1096; Admiralty J0324; USCG 1-10795. 1936 (Pusey and Jones Corp., Wilmington, DE). Decommisioned 1975. 2-masted steel lightship, length 149 ft (45 m), beam 32 ft (10 m); this is the largest U.S. lightship. Ship's hull painted red, superstructure white. Ron Janard's photo is at right. The ship served all of its career, except for World War II, on the Nantucket Shoals station off Massachusetts. It is one of three surviving lightships known as Nantucket. The ship was at Nantucket as a museum vessel from 1976 to 1984; later it was owned by the HMS Rose Foundation and berthed at Bridgeport, Connecticut. In 1989 it was recognized as a National Historic Landmark. In 2002 the lightship was sold for $1 to the National Lighthouse Museum on Staten Island, New York. In October 2003 the ship was at Oyster Bay on Long Island, New York, where volunteers worked to restore its systems. Initially, the ship was supposed to remain at Oyster Bay for only six months, but its stay was extended for several years. Some residents thought it had worn out its welcome, but others considered it an asset to the harbor. In December 2006 the cash-strapped museum board changed its mind about the lightship and put it back on sale for $1 to any preservation group willing to take it. A new organization, U.S. Lightship Museum, Inc., began raising funds and planning to move the lightship to Boston. In October 2009 the lightship museum group put up its $1 and took title to the lightship. The ship was welcomed back to Boston on 12 May 2010. After restoration and repairs at the Fitzgerald Shipyard in Chelsea, the ship is now on display at the Boston Harbor Shipyard and Marina. By June 2012 the restoration of the exterior of the ship was almost complete and work had begun on the interior. In December 2014 American Express announced a grant of $250,000 to restore the ship's lantern, fog signal, and electrical system. A fundraising drive for additional repairs began in May 2015. In 2019 the ship received a $575,000 grant from Community Preservation Act (CPA)-Boston for hull restoration in drydock. A photo is at right, and Google has a satellite view of the ship moored at the marina. The marina is located at the end of Marginal Street on the Chelsea waterfront; parking is available. Site open, ship closed for restoration during 2019; usually open on Saturdays late April through October (group tours available by appointment). Owner/site manager: U.S. Lightship Museum, Inc. ARLHS USA-522. 1950. Decommissioned 1985. 2-masted, 617-ton steel lightship, length 128 ft (39 m), beam 30 ft (9 m). 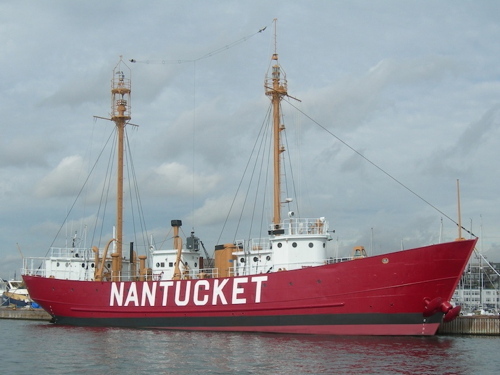 The ship served most of its career off San Francisco, but it was also stationed off Portland, Maine, and from 1975-1983 on the Nantucket Shoals station, where it alternated on station with Nantucket II and was one of the last two U.S. lightships in service. 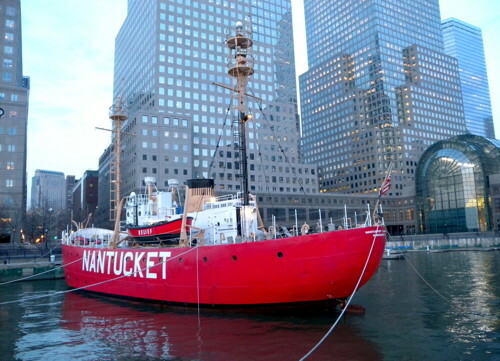 Anderson has a good page for the lightship, Wikimedia has Jim Henderson's February 2009 photo (also seen at right) of the ship moored at lower Manhattan, and Jef Nickerson has a November 2006 photo of the lightship at Boston. In 1987 the vessel was purchased for $1500 by the Metropolitan District Commission of Boston with the intention that it would be refurbished as a museum. These plans were never carried out, and in the end the state allowed the ship to deteriorate at a berth in Quincy. In 1999 the State of Massachusetts declared the ship surplus property, and on March 15, 2000, the state put the ship up for auction on eBay. It was sold to Bill and Kristin Golden, who renovated the vessel and put it back into operation. The ship arrived in Boston under its own power in October 2002 and was moored off season at Rowe's Wharf on the Boston waterfront. In late 2004 the Goldens announced plans to berth the ship at Nantucket during the summer and sell shares in the vessel to would-be summer residents. However, nothing came of these plans. In January 2006 the Goldens put the lightship up for sale with an asking price of $7.6 million, but the ship found no buyers. In 2008 the Goldens sailed the ship to New York, where it was based at Battery Park City in lower Manhattan. In 2009 they sailed the ship to Hyannis, Massachusetts, flashing its light as a memorial to Senator Edward Kennedy. In late summer 2009 the ship was anchored at Vineyard Haven, Martha's Vineyard. In the summer of 2013 it was at Jamestown, Rhode Island, and it was scheduled to move to New York in the fall. In 2015 it was berthed at Pier 25 in Hudson River Park; a photo is available. For the 2016 season it moved to the new One°15 Brooklyn Marina at Pier 5, south of the Brooklyn Bridge. According to an October 2018 article in Boat International, both Nantucket I and Nantucket II were "berthed in New Bedford, Massachusetts, side by side." 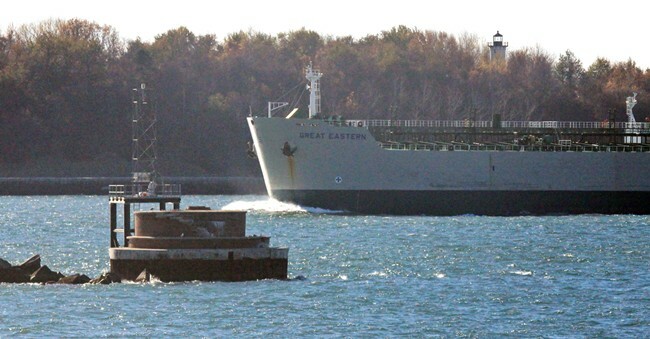 In January 2019 the Goldens had Nantucket I listed for sale for $5.2 million, apparently berthed at the Commercial Wharf in downtown Boston. Owner/site manager: private. ARLHS USA-523. Date unknown. Active (privately maintained); focal plane about 43 ft (13 m); white flash every 2.5 s. Light mounted atop the Sugar Bowl Shade Shelter, a covered observation shelter. Trabas has a closeup photo, Jim Frey has a street view, and Google has a satellite view. Pleasure Bay is a section of Dorchester Bay, in South Boston on the south side of Castle Island, the location of the early 18th century Fort Independence. The bay is enclosed by causeways leading to a small island, the site of the shelter. Accessible by walking the causeways; the shelter is about 3/4 mi (1200 m) from Fort Independence. Site and shelter open daily. Owner/operator: Massachusetts Department of Conservation and Recreation (Castle Island Park). Admiralty J0336; USCG 1-11235. 1900 (station established 1819). Reactivated (inactive 1982-1985); focal plane 120 ft (36.5 m); white flash every 2.5 s. 52 ft (16 m) round cylindrical brick tower with lantern and gallery, solar-powered VLB-44 LED optic. Tower painted white, lantern and gallery black. Keeper's house demolished. D'Entremont's photo is at right, Anderson's page for the lighthouse has photos, Trabas has a photo, Marinas.com has aerial photos, Huelse has a historic postcard view, the Coast Guard has a historic photo, and Bing has an aerial view. Sibling of Eastern Point Light. This is the second oldest light station in the harbor. The original 23 ft (7 m) rubblestone tower was replaced in 1844 by the first cast iron lighthouse built in the U.S. The Coast Guard has a historic photo of that light. It was replaced in 1881 by a second cast iron tower similar to the Race Point Light on Cape Cod. In 1900 that light had to be removed to make way for an extension of Fort Strong. The present brick tower, built in 1900, was renovated in 1998. In 2011 lighthouse fans were pressing for public access to the lighthouse but the city administration was resisting and no access has been provided. Long Island is the site of several city facilities, including a large shelter for the homeless and a summer camp for inner-city youth. Located on the northern tip of Long Island at the entrance to Boston's Inner Harbor, directly opposite the Deer Island Light. Long Island, included in the Boston Harbor Islands National Recreation Area, is connected to the mainland by a causeway, but access to the lighthouse is closed. Visible only by boat. Site and tower closed. Owner/site manager: U.S. Coast Guard. ARLHS USA-449; Admiralty J0337; USCG 1-10800. 1805. Octagonal stucco-covered wooden pyramid, painted black with a white horizontal band, mounted on a granite base. Philip Harwood has a good photo and Google has a satellite view. Not a lighthouse, but a very famous unlighted aid to navigation, this beacon was built by the state of Massachusetts. It has been adopted as the symbol of the Friends of the Boston Harbor Islands. In 2001 the Coast Guard announced it would replace the deteriorated landmark, but following protests from the Friends and others it carried out a complete restoration in 2003. Located on a tiny scrap of land east of Long Island Head and north of Gallops Island. Accessible only by boat; visible from many harbor tours. Owner/site manager: U.S. Coast Guard. USCG 1-11450. 1903. Inactive since 1939. The lighthouses, 31 ft (9.5 m) and 40 ft (12 m) wooden towers, were demolished in 1939 to make way for an extension of Fort Standish. The original brick oil house remains, but it is in ruins; Chris Klein has a 2007 photo (note the Nix's Mate beacon in the background). 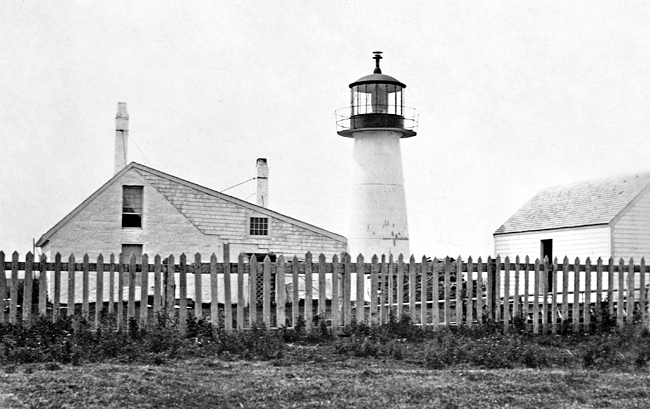 The Coast Guard has a historic photo of the lighthouses. Lovells Island is accessible in the summer by passenger ferry service; individual and group camping available. Located on an island roughly midway between Long Island Head and Boston Harbor Lights. Accessible only by boat. Site open. Owner: U.S. National Park Service. Site manager: Boston Harbor Islands National Recreation Area. ARLHS USA-456 and 1114. 1783 (oldest U.S. light station, established 1716). 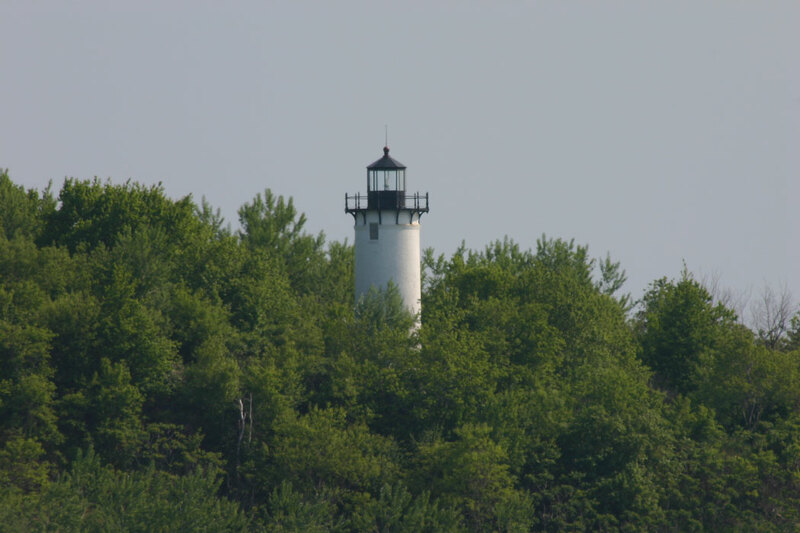 Active; focal plane 102 ft (31 m); white flash every 10 s. 89 ft (27 m) round rubblestone tower with lantern and gallery (raised from 75 ft (23 m) in 1859), rotating 2nd order Fresnel lens (1859). Tower painted white, lantern black. Fog horn (2 blasts every 30 s). Recently restored 2-story Victorian wood keeper's house (1884), fog signal building (1876), oil house (1889), and other buildings. A photo is at right, Anderson has an excellent page for the lighthouse, Trabas has a photo, Marinas.com has aerial photos, Huelse has a historic postcard view, Michael Sudol has a street view, and Google has a satellite view. This light tower replaced the first U.S. lighthouse (1716), which was blown up by retreating British troops in 1776 (a 1719 fog cannon survives from the earlier light station). It is the second oldest U.S. lighthouse (after Sandy Hook, New Jersey) and it was the last U.S. lighthouse to be automated (1998). Power for the light now comes from a wind turbine in Hull. One of the most famous of all U.S. lighthouses, it is recognized as a National Historic Landmark. This is also the only light station still staffed--purely as a light station--by the Coast Guard, although a number of other lighthouses are located on the grounds of active Coast Guard stations. Historic Boston, Inc., and the Massachusetts Department of Environmental Management have sponsored restoration of the light station. 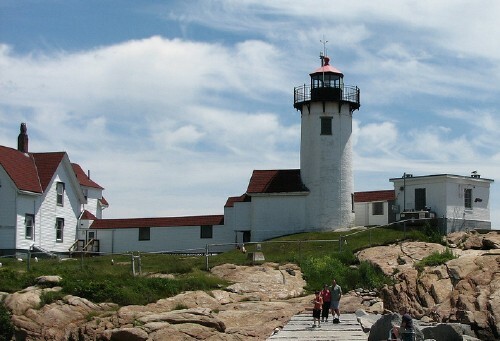 In May 2014 the Coast Guard announced a $1.5 million project to repaint and refurbish the lighthouse and other station buildings in preparation for the celebration of the light station's tricentennial in 2016. The project was completed on schedule in the spring of 2016. 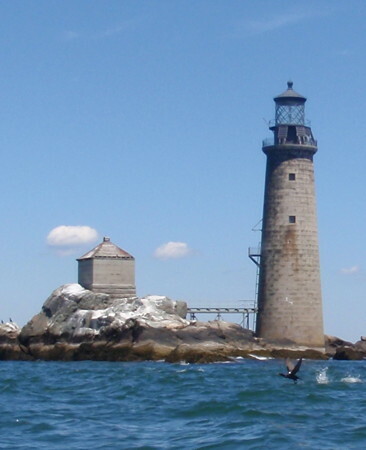 Friends of the Boston Harbor Islands schedules boat tours to the lighthouse Fridays, Saturdays, and Sundays during the summer season. Reservations are required; check their events page for tickets. Located on Little Brewster Island north of Hull. Accessible only by boat. Site open, tower open to guided tours. Owner/site manager: U.S. Coast Guard. ARLHS USA-073; Admiralty J0314; USCG 1-0425. Flickr Creative Commons photo by Michael K.
1860 (Barton S. Alexander). Active; focal plane 85 ft (26 m); 8 flashes every 45 s, in a unique 1+4+3 pattern: 1 flash, 5 s off, 4 flashes, 5 s off, 3 flashes. 114 ft (35 m) unpainted round granite tower with lantern and gallery, incorporating keeper's quarters; solar-powered 300 mm lens (1983). Lantern and watch room painted gray. A 3rd order Fresnel lens (used 1964-1971) is on display in a replica lantern at the 2-story wood keeper's house (1858) located onshore on Government Island in Cohasset. Fog bell also on display. Assistant keeper's house and oil house also located on Government Island. C.M. Hanchey's photo is at right, Lighthouse Digest has D'Entremont's article on the history of the lighthouse, Anderson has a fine page for the station, Trabas has a photo, Dorothy Lodovici has a view from shore, the National Park Service has a page for the lighthouse, Marinas.com has aerial photos, Huelse has a historic postcard view, and Google has a satellite view. Google also has a satellite view of the keeper's house in Cohasset. The lighthouse is famous for its highly exposed location and for its unique "I love you" light pattern. The National Archives has a drawing of the first tower, which was lit on New Year's Day 1850. Keepers were convinced the tower was not safe, and they were right: two keepers were killed when the lighthouse collapsed in a storm on the morning of 17 April 1851. Salvaged from the disaster, the original fog bell hangs in the steeple of the Baptist Church in Bryant Pond, Maine. The present tower took 5 years to build and is still considered a major engineering accomplishment. The tower was restored in 1989. 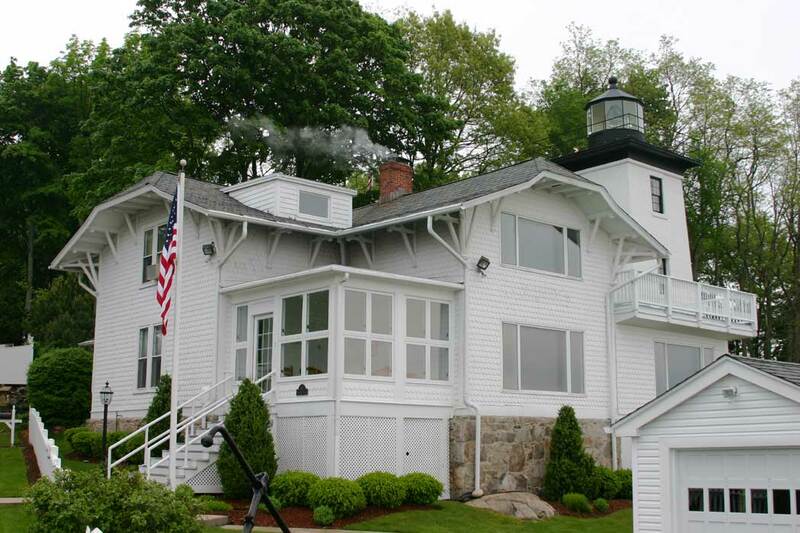 The onshore keeper's house was restored in 1992-93 through the efforts of the Cohasset Lightkeepers Corporation. It is a favorite location for weddings. In 2009 the lighthouse became available for transfer under NHLPA, but there were no takers. 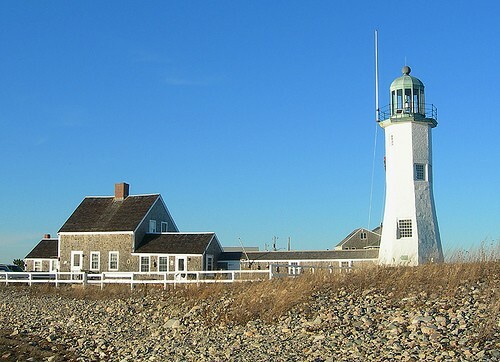 In 2013 the General Services Administration offered to transfer the lighthouse at no cost to the Town of Scituate, but the town did not accept. An auction sale of the lighthouse began in June 2014, and in October it was sold for $222,000 to philanthropist Bobby Sager. In 2017 new signage was installed at the shore station. The surviving brick oil house, now used as a sailing club's storage facility, may be restored. Located about 2 km (1.25 mi) northeast of Minot Point. Lighthouse accessible only by boat. Light tower closed, but the Cohasset keeper's house is open. Tower owner/site manager: private. Onshore station owner: Town of Cohasset; site manager: Cohasset Lightkeepers Corp. . ARLHS USA-502; Admiralty J0360; USCG 1-0440. Note: Scituate is a small seaport of about 18,000 residents roughly halfway between Boston and Plymouth. 1811 (heightened by 15 ft (4.5 m) in 1827). Reactivated (inactive 1860-1994; now privately maintained); focal plane 49 ft (15 m); white flash every 15 s. 50 ft (15 m) round granite and brick tower connected by a covered "runway" to a 1-1/2 story keeper's house. FA-250 lens. Tower painted white; lantern and gallery are green. The lantern is a replica installed in 1930. Stephen Masiello's photo is at right, Anderson has a good page with several photos, Trabas has a photo, Marinas.com has aerial photos, Huelse has a historic postcard view, Google has a street view, and Bing has an aerial view. 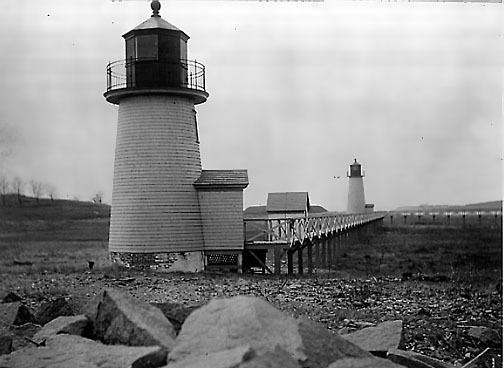 After being closed in 1860, the keeper's house was reopened (1891-1924) to serve the Scituate North Jetty Light. The light station has been restored through the efforts of the Scituate Historical Society and Cedar Point Association. The keeper's house is leased to a resident lightkeeper. In 2001 historical displays were installed in the covered walkway connecting the light tower and keeper's house. Lighthouse Digest has a March 2003 article on these and other recent efforts, and the historical society has a web page for the lighthouse. In 2008 lightkeeper Ruth Downton retired after 23 years; she was succeeded in early 2009 by Bob Gallagher, a high school social studies teacher. 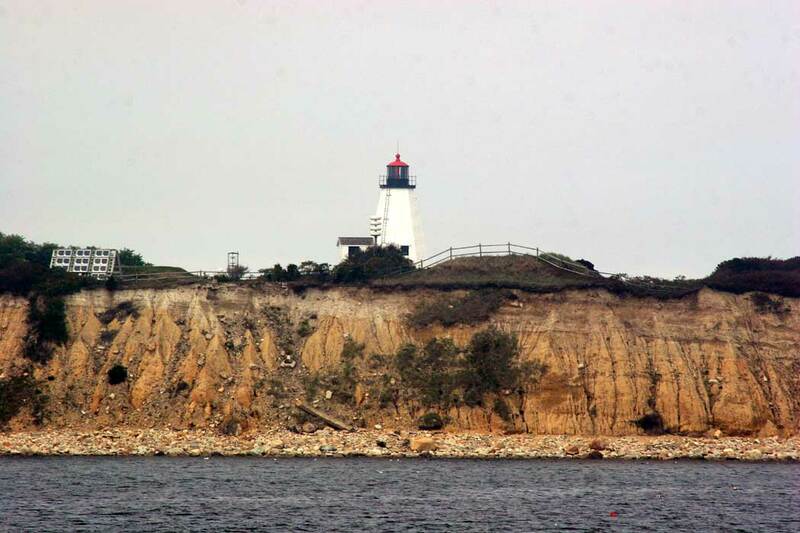 In November 2012 plans were announced for a stone revetment to better protect the lighthouse from storm damage; this project was completed in late 2013. 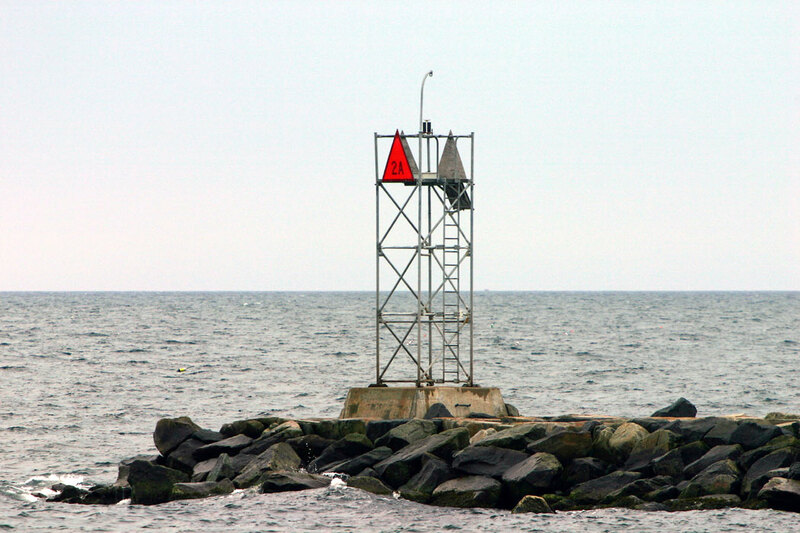 Located in Lighthouse Park on Cedar Point on the north side of the entrance to Scituate Harbor. Site open, tower closed except for an occasional open house. Owner: Town of Scituate. Site manager: Scituate Historical Society (Scituate Light House). ARLHS USA-742; Admiralty J0363; USCG 1-12275. 1958? (station established 1891). Active; focal plane 31 ft (9.5 m); red flash every 4 s. Approx. 24 ft (7 m) square cylindrical skeletal tower. Trabas has a photo and Bing has an aerial view. An older skeletal tower was tended until 1924 by keepers housed at the Scituate Light keeper's house. Located on the end of the jetty at Cedar Point, Scituate. Site open. Owner/site manager: U.S. Coast Guard. ARLHS USA-1273; Admiralty J0362; USCG 1-0465. Note: Plymouth is famous as the site of the first successful English settlement in New England in 1620. The town's harbor serves mostly recreational vessels. 1843 (station established 1769). Active; focal plane 102 ft (31 m); 3 white flashes every 30 s, flashes separated by 5 s; a red sector covers dangerous rocks. 34 ft (10 m) old-style octagonal pyramidal wood tower with lantern and gallery, covered by cedar shingles; 190 mm lens. Tower painted white; lantern black with red roof. Fog horn (2 blasts every 15 s). 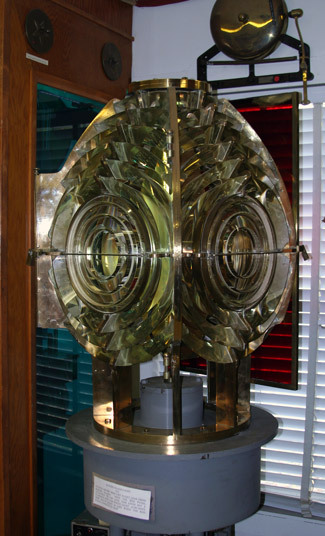 The original 4th order Fresnel lens is on display at the Hull Lifesaving Museum in Hull. The modern ranch style keeper's house (1963) was renovated in 2007 and is available for vacation rental. A photo is at the top of this page, D'Entremont has a fine photo from about 1996, Anderson also has a good page for this lighthouse, Trabas has Ronald Wöhrn's photo, Lighthouse Digest has D'Entremont's March 2003 article on the history of the light station, Marinas.com has aerial photos, and Google has a satellite view. Originally the station had twin lighthouses (as seen in Huelse's historic postcard view); foundations remain of the former north tower, demolished in 1924. This is the nation's oldest active wooden light tower and the only survivor of many small wooden pyramidal lighthouses built in New England prior to 1850. The lighthouse was relocated 140 ft (43 m) north in December 1998 to escape beach erosion. Project Bug Light leased the lighthouse from the Coast Guard in 1999. Located on a bluff at Gurnet Point, at the end of a long sand spit on the north side of Plymouth Harbor. There is no public road access; the lighthouse is accessible by boat or by a 5-mile (8 km) hike on the beach from Duxbury Beach. Site open, tower closed except for occasional open house events. Owner: U.S. Coast Guard. Site manager: Project Gurnet and Bug Lights . ARLHS USA-609; Admiralty J0366; USCG 1-12545. 1871. Active; focal plane 35 ft (10.5 m); 2 red flashes every 5 s. 47 ft (14.5 m) round sparkplug cast iron tower (brick lined) with lantern and upper and lower galleries, incorporating 2-story keeper's quarters and mounted on a concrete caisson; solar-powered 250 mm lens. Fog horn (blast every 15 s). Lower half of lighthouse is red, upper portion white, lantern black. David Sugden's photo is at right, Luis Lebron has a fine photo, Anderson's page has a closeup, Trabas has a photo, Huelse has a historic postcard view, and Google has a satellite view. This is the oldest of the U.S. sparkplug towers and the first caisson lighthouse built in the U.S. The lighthouse is chronically endangered by age and weather. Project Gurnet and Bug Lights worked to restore the tower in the mid-80's and again in the mid 90's. In 2001 Campbell Construction completed a $40,000 restoration and repair project. Lighthouse Digest has D'Entremont's September 2001 feature on restoration efforts here and at the Gurnet (previous entry). In 2009 the Coast Guard agreed to repair the upper gallery handrail and lantern windows; additional repairs and a repainting were carried out in 2010. In May 2014 the lighthouse became available for transfer under NHLPA. Project Gurnet and Bug Lights applied for ownership, but there's been no announcement of a transfer. 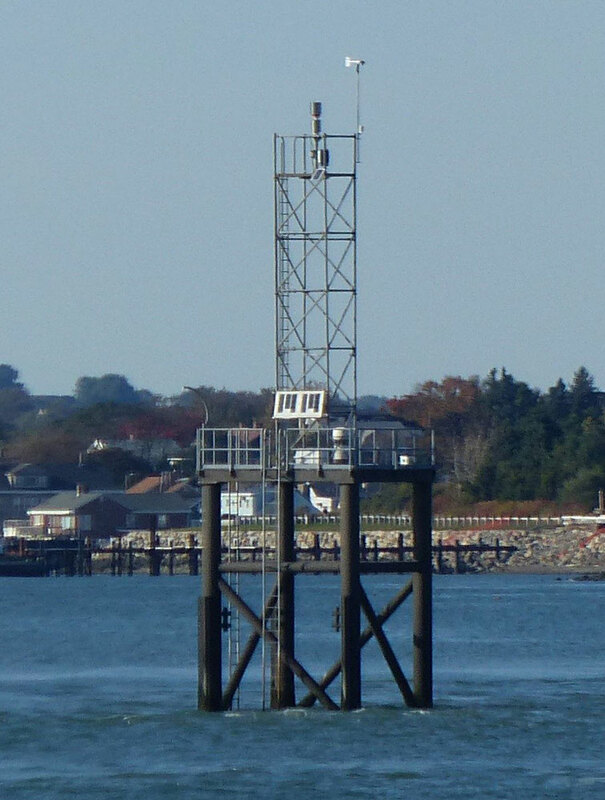 Located in Duxbury Bay (not on a pier) on the north side of the entrance channel to Plymouth. 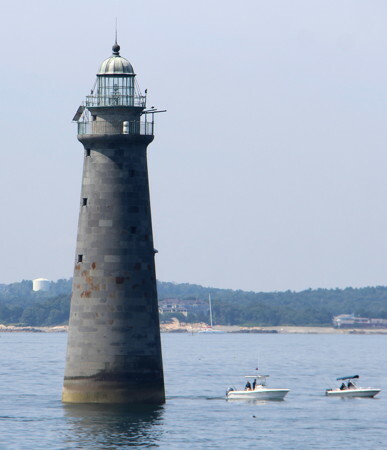 Accessible only by boat; visible from Plymouth Harbor boat tours. Site and tower closed. Owner: U.S. Coast Guard. Site manager: Project Gurnet and Bug Lights . ARLHS USA-251; Admiralty J0368; USCG 1-12580. Broad Sound Channel Inner Range Lights (1903-1950s), Boston Harbor. These lights were at the north end of Spectacle Island. The range was discontinued in the 1950s and nothing remains of the lighthouses. ARLHS USA-953 (front) and 954 (rear). Egg Rock (1897-1927), off Nahant. The light was deactivated in 1922. The keeper's house was destroyed during an effort to move it to a barge for relocation, and the light tower was demolished in 1927. There is no longer a light on the island. ARLHS USA-956. Narrows (1856-1929), Boston Harbor. This lighthouse, a cottage screwpile, marked the outer entrance to The Narrows, a passage on the south side of Lovell Island. The lighthouse was destroyed by fire on 7 June 1929. It was replaced by a light on a skeletal mast (Admiralty J0318; USCG 7-11430) southwest of the original location, near the edge of the channel. ARLHS USA-960. Spectacle Island Range Lights (1897-1913), Boston Harbor. This range was discontinued in 1913 and nothing remains of the lighthouses. ARLHS USA-1389 (front) and 1390 (rear). Posted 2001. Checked and revised April 14, 2019. Lighthouses: 25; lightships : 2. Site copyright 2019 Russ Rowlett and the University of North Carolina at Chapel Hill.